There are way too many comment login systems out there. Each blogging platform (WordPress, Typepad, Blogger) has its own login system, then there are the cross-platform commenting systems like Disqus and JS-KIT. But many of these will soon give way to Facebook Connect and Google’s Friend Connect. I am talking about just the ID people use to login, not the commenting systems themselves. We adopted Facebook Connect as a login option for anyone who wants to leave a comment on TechCrunch, and it already accounts for more than 20 percent of our comments. FB Connect is also now available to any of the 500,000 blogs and sites that use the JS-Kit commenting widget, and Disqus is planning on implementing Facebook Connect before the end of the year. Other blogs are adopting Google’s Friend Connect (which lets people login with various email credentials, or even Twitter). JS-Kit is also working on adding Friend Connect, as well as MySpace ID as login options. 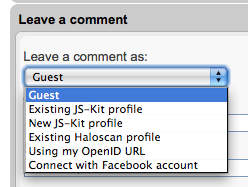 All of this choice is great, except that already there are six different login options in The JS-Kit widget (Guest, Existing JS-Kit, New JS-Kit, Haloscan, OpenID, FB Connect). Pretty soon we’ll need the equivalent of a “Share This” button, perhaps a “Universal ID” button, that will then open up to all the options. But I think that’s too much. Engineers may feel it is egalitarian, but consumers run away when they are presented with more than 3 or 4 options. That is why I think Facebook Connect and Google Friend Connect will win in the end (Sorry, MySpace). People may have IDs for the various blogging platforms or commenting systems, but most don’t identify with them. It is a necessary inconvenience. They identify with Facebook or their email because that is where they manage their personal and professional lives. 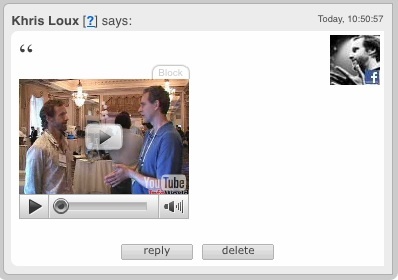 In addition to replicating the comments on your Facebook News feed, the JS-Kit implementation also supports embedding Facebook photos and YouTube videos directly into the comments. It makes commenting much more personal when you know your friends will see it in Facebook. It also has the potential to reduce the amount of comment trolling and general incivility that has taken over many blog comments (we hope). Update: No sooner did I post this than I learned that not only is Disqus working on a Facebook Connect plugin, but so is Six Apart (for Movable Type), WordPress, and MediaWiki. Here is an entire Facebook Connect plugin directory. Grou.ps is also adding FB Connect.